Whether you’re looking to put your home on the market, or just want to dress your home to impress, improving your curb appeal is always a good idea. Whether you’re looking to put your home on the market, or just want to dress your home to impress, improving your curb appeal is always a good idea. Choosing the right landscaping is the perfect way to create a dramatic increase in value that will help create a long-term visual improvement to your home. Unlike interior trends, landscaping trends tend to last, making them far more worthy of investment. As you begin to consider your options for landscape design one of the first things you must consider is the cost vs. long-term benefits of hiring a professional landscaper versus going the DIY route. While you may be able to create a beautiful design and enact it yourself, there is more to landscaping than picking flowers. A professional landscaper will understand which plants will work best in your yard and how they will grow and develop to ensure that your home looks as beautiful in 10 years as it does six months after planting. Not to mention, having a professional maintenance plan will ensure that all of the necessary care is being completed on time and with expert knowledge. As you consider your options for plants, there are a lot of factors to consider. One of the most important features to understand is the potential for long-term health. Planting native, perennial plants, for instance, will ensure that your landscape looks better, and fuller year to year as your plants grow and develop. Using native plants will ensure that your landscaping thrives with minimal effort and care. This is particularly good for those looking for landscaping options that are cost-effective and low-maintenance. There are few things as relaxing as the sound of running water. Adding a simple water feature to your landscaping can be a huge benefit to your curb appeal and your personal wellness. The meditative effect of a water feature is well known to help with creating a relaxing atmosphere. Few things can immediately transform a sub-par or common home design than beautiful trees. Planting trees on your property offers a variety of benefits, they help muffle and block noise from the street, help improve your privacy, and help keep your property cooler in the summer. Additionally, the benefits of trees move into the spectrum of health as well; they help clear the air of pollution and create oxygen, which can improve the air quality of your home. 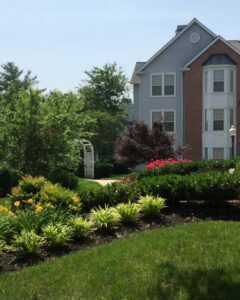 Atlantic Maintenance Group is a full-service landscaping company, providing maintenance, design, and construction, as well as snow removal, and asphalt and concrete services. To get your free quote today, give us a call at 410-768-4720 or contact us via our website today. You can also follow us on Facebook, Twitter, Pinterest, and Google+ to see how we’re growing! This entry was posted on Friday, September 21st, 2018	at 4:02 pm	and is filed under Curb Appeal	. You can follow any responses to this entry through the RSS 2.0	feed. Both comments and pings are currently closed.